Frome celebrated the royal wedding in style at the weekend by coming together for street parties, afternoon teas and some ‘right royal’ activities to send their well-wishes to the new Duke and Duchess of Sussex. Frome and District Friendship Club celebrated with a royal-themed party at Frome Football Club, local schools, shops and groups celebrated with parties, decorated windows and fun celebrations while friends and neighbours in The Grove had a royal street party with thanks to Joyce and John Pearn. They wanted to use the occasion to bring the community together so put on a very British spread of food and made impressive wedding style cakes. Leah Champion-Smith, who attended the party said, “everything was arranged and paid for by our lovely neighbours Joyce and John, a lovely couple who wanted to make the community get together up at The Grove both the children and the adults – all for the royal wedding celebrations. 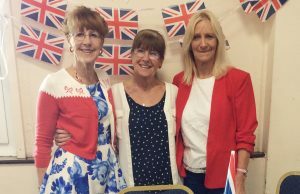 Frome and District Friendship Club said that members had a ‘real humdinger’ of a party at the Frome Football Club Venue to celebrate the royal couple’s wedding. “Decorations adorned the hall and we enjoyed a lovely meal, a good old fashioned chicken pie (thank you Simon and staff), with a choice of numerous deserts,” said the club. “We were joined by a number of Frome College students for lunch, who were accompanied by their year head, Damon Johnson, who actually won the teddy bear competition, winning the teddy donated by Audrey Stacey (thank you Audrey). The students left after lunch with us, to get back to their lessons and lectures. “We were then entertained by ‘Elvis Presley’, our local, look-alike, sound- alike Elvis (thank you Tim). This added a perfect touch of the United States just for Meghan. We had flags flying, plates of cakes and fancy biscuits were more than plentiful, tea, coffee and squash were also served by our committee (thank you all). “We had an abundance of raffle prizes, donated by our own members (many thanks). “This was a truly wonderful party, (the likes of such reminded many of us of the Queen’s Coronation parties that were held all over the country) held with the full support of our members. “Meghan and Harry are, along with the other lovely young royals, our hope for peace and acceptance of all that is good in this complicated world we live in.